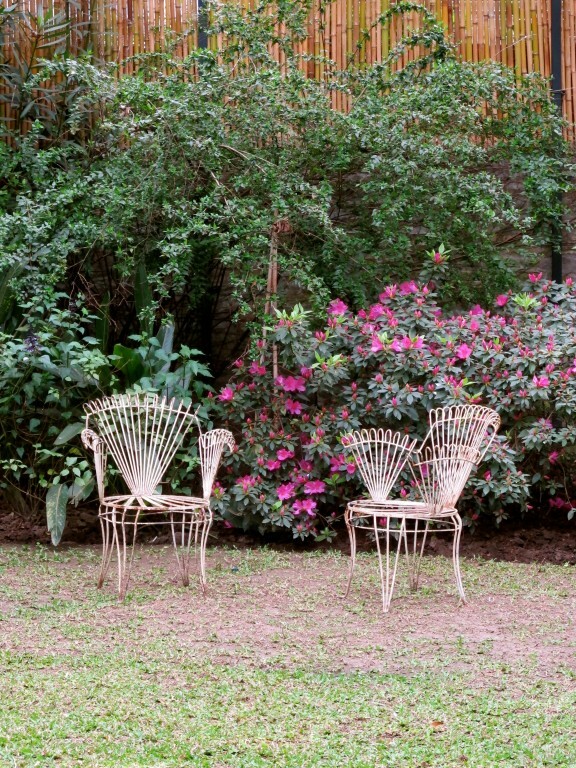 In the hip, happening Buenos Aires neighborhood of Palermo Soho, there is a secret garden . . . and in the two houses on either side are the guest rooms of L’Hotel Palermo, one of the four hotels I stayed in during my eight day trip to Argentina. Palermo Soho is known for its trendy boutiques, art galleries, and restaurants, not unlike the Soho of New York City. An unassuming townhouse opens into a secluded sanctuary in this lively, and often noisy, area of town. There wasn’t much of a sign for the hotel, and the street was a bustling conglomeration of graffiti, construction, and funky cafés. I wasn’t sure what to expect as I pressed the little button, alerting someone inside to answer the door. Inside, the lobby was quiet and elegant, an intriguing contrast to the outside world of the slightly gritty neighborhood. Straight ahead are French doors that lead to the garden, and twenty-four distinctly unique guest rooms. There’s a cobblestone walkway leading out to the garden, and to the rooms. The vines hanging from above give the impression of walking through a fringe curtain. If I can orientate you with my photos, on the left is one house of guest rooms, and the others are in the building beyond, to the right of the garden. This cozy terrace with rattan furniture, next to a time-worn cast iron table and chairs, overlooks the pool, and adjoins the sitting room / dining room. The pool in the garden is sublime in its simplicity . . . it was still winter when I was there in September, but I can just imagine how glorious it would be to take a dip at the end of a hot summer day. As the rooms are situated within two separate houses, each one is slightly different . . . some have a view to the garden, others have a private balcony or terrace. The furnishings are the perfect balance of old and new, another feature that makes you feel like you’re staying in a private home. My room, #23, was through the sitting room / dining room, up the spiral staircase, and across a bridge of glass bricks. This is a view of the dining room from my glass bridge. Breakfast is served here, overlooking the garden and pool. This neighborhood, and the charming L’Hotel Palermo, couldn’t have been more different from the Mio in Recoleta, but they’re every bit as appealing . . . I love this hotel-changing game! Next, I’m hopping on a boat to Colonia del Sacramento, Uruguay . . . it’s an easy day trip from Buenos Aires, but I figured I might as well stay a night.